I arrived in Vienna yesterday morning at 7.40 a.m. Somehow I hadn’t thought about what that meant for getting up though: my alarm rang at 3.45 a.m. Yet on the other hand I had the whole day in Vienna. Arriving at the hostel, Wombats at the Naschmarkt, which by the way is really new, good and very centrally located, I couldn’t check-in yet but drop off my luggage so after a quick look in the map I made my way to the the Museums Quartier. The area with the signature seats all over the place was so nice and sunny, I decided to stop there for breakfast. I was thinking I might also go and see one of the museums there but for just a quick visit they were all just too expensive (11€ I can spend on better things than museums. Even the Documenta was only 20€ per day and London’s museums are mostly free). Lucky enough choice. 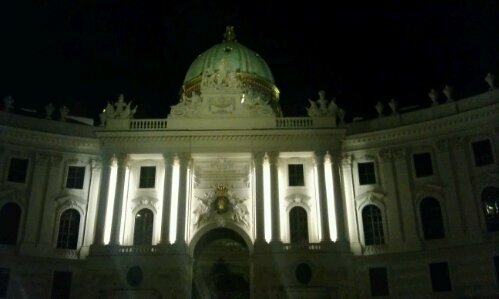 Because when I moved on and came to the Hofburg, I saw that today, on the 6th, was the “Lange Nacht Der Museen”, the Museum’s Night, where you can see many museums with one ticket, an idea Eeva liked too when she arrived later that day. From the palace I could also see an exciting other building which according to my map had to be the city hall and I walked there. On my way I also passed the Hoftheater. 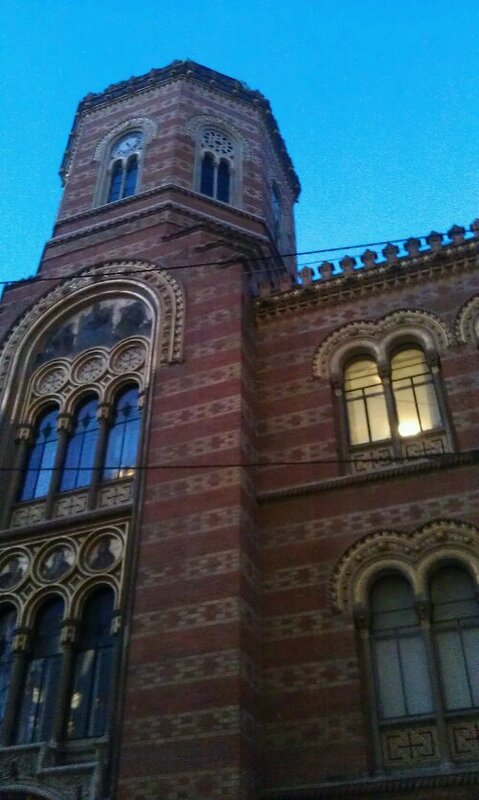 Which like everything else in Vienna looked beautiful and imperial too. The impressive neogothic cityhall was a good photo opportunity when I finally reached it, looking a bit funny with its child friendly Welcome sign over the main entrance. From here I went further inside into the inner city yet I got a little bit lost as I had no real direction and after having made it half way to the Stephansdom I decided to go back to the hostel first to have lunch and than a nap. And that was what I did. I could finally check-in, had a nap and a shower before Eeva arrived. With Eeva I went back to the city center. We made our way through the quarter of Wieden 4 that our hostel belongs too, passed the Opera and finally arrived at the Cathedral. As usual I was a bit disappointed by this landmark building. While not only the part of inner city close to the palace but also the area close to our hostel, especially Mariahilf, has lots of impressive imperial neo-classicistic or even art nouveau buildings that all look like palaces, the cathedral is crammed between rather old and some new and ugly buildings and the place is swarming with people trying to sell you tickets to a concert which is just annoying (if someone offers me tickets and I say no, I mean no and not, ask me again and try to start a conversation on why I’m not interested). So we went further and finally came to the Danube canal which was not too impressive too. But the houses between cathedral and canal where. Older and smaller than what we had seen before. It gave a new feeling to otherwise just imperial 19th century Vienna. And so we decided to have a traditional dinner in the area. Lonely Planet as well as a local magazine I had flipped through in the hostel reccomended Beim Czaak where we finally ended up after having checked up Figlmüller too, a recommendation by a friend but a really touristic place. We both had a Schnitzel which was huge yet nice and prices where ok too (one reason we stay in a 6-bed-dorm in a hostel was that we wanted to have more money to spend on food). On our way back we stop at an old pub (that according to my guide, as it turn out later, was supposed to be a coffee house) for a beer, Alt Wien. Huge as it was and in the city center I guess we probably were one of the few or maybe even the only tourists there which was nice as actually we were only there for a beer and a chat anyway, like everyone else. Walking back early (as my lack of sleep still bugged me) we passed the palace which we admired with is nice light installation and the museums again before coming home and going to bed early. Now it’s nine a.m. and I guess I get up and have a shower before we are going to do more sightseeing. Today we do a bit more of what I did yesterday, we want to find a good Viennese coffee house and in the evening then the Museum’s Night. But first of all breakfast. This entry was posted in Austria and tagged Art Nouveau, Cafe, Hostel, Jugendstil, Restaurant, Short Trip, Vienna by kathatravelling. Bookmark the permalink.